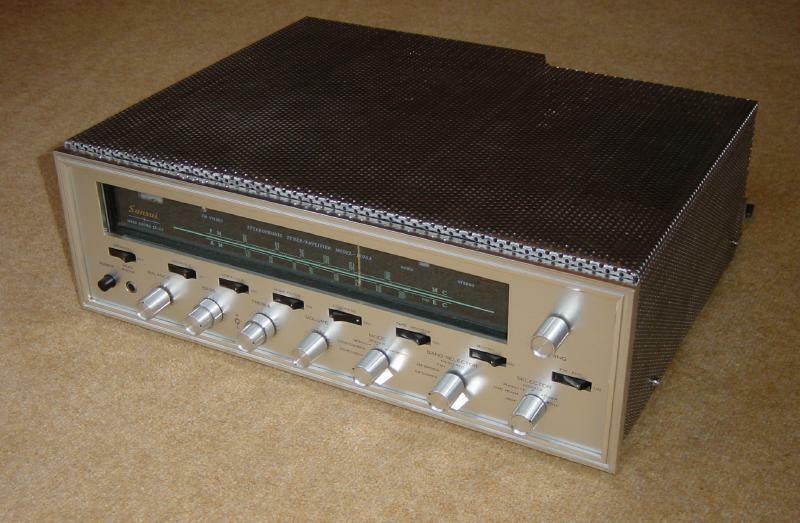 The first time I saw the Sansui I did a double take. 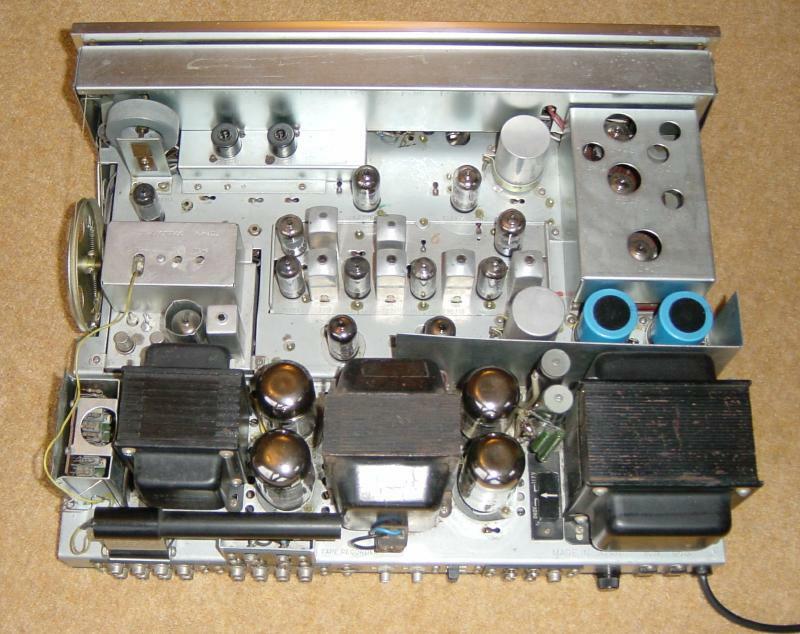 I was surprised to see what appeared to be a piece of 1970's transistor hifi being sold at the NVCF, but as I looked away from the front panel and over the chassis I saw that this receiver was valve and not transistor. I was at the "National Vintage Communications Fair" in Birmingham (UK). This show is for vintage communications equipment and one can normally find old and vintage radios (both broadcast and ham band), old telephones, televisions & hifi together a selection of interesting components. 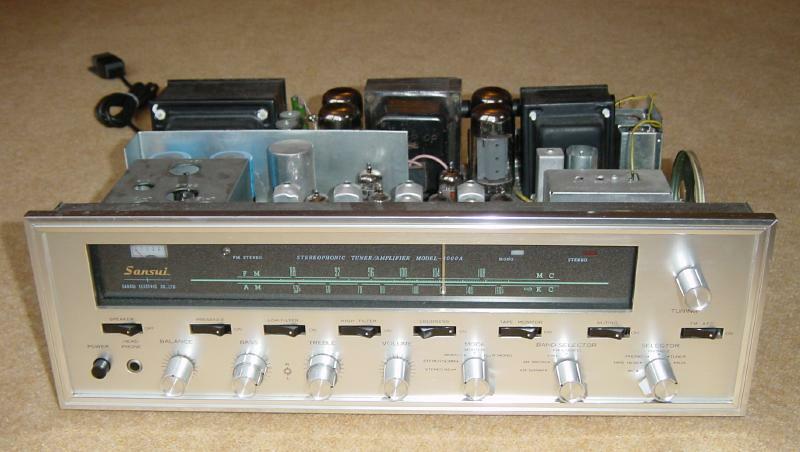 The Sansui had no top cover and the air of a "project in progress" about it although the front panel was unmarked and the valve complement seemed complete. After some unsuccessful haggling I ended up handing over the asking price of £65 (about $100) cash. 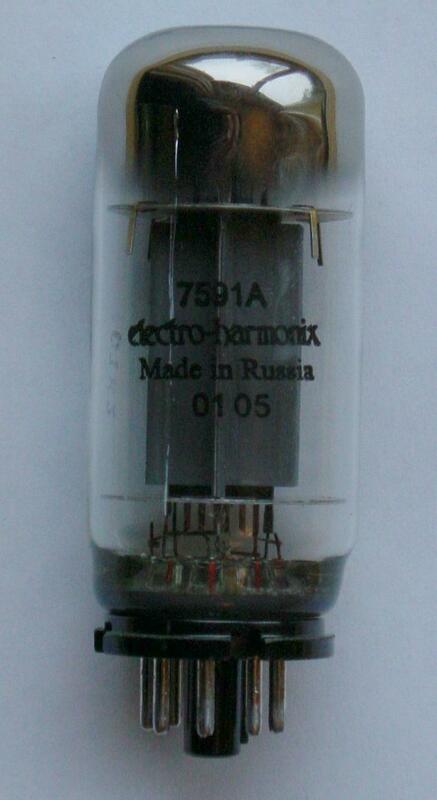 I'd already spotted the four 6L6 tubes, obviously in the output part of the circuit. Closer inspection revealed that the two output transformers were not identical, one of the originals had failed (or been damaged by another fault) and so had been replaced. The repair was reasonable mechanically but I decided to fully check the new wiring out. 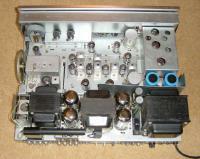 I found two schematics online for this receiver: here and here. A quick look at the schematic revealed that the output tubes should have been 7591A valves, and not the 6L6 valves fitted. The pinout for the two types is not identical and in fact the characteristics are not particularly similar either! I spent a few hours satisfying myself that the unit would not come to harm when I plugged it in, making good various connections and substituting some different coloured wire in places to make it easier to see what was going on. I added 3.3 Ohm resistors in each of the 6L6 cathode connections so that I could monitor the current in each valve. The bias supply circuitry has a potentiometer for each valve to allow the standing current to be individually adjusted. I replaced the original 2 core mains lead with a 3 core lead (thus earthing the chassis), changed the unit's original back panel 4A fuse with a 2A fuse and disconnected the two US style 2 pin power sockets on the back of the unit. These would have otherwise been live with 240 V mains power when the unit was on. These features suggest a unit primarily made for the US & Japanese markets but also imported (without change :) into the UK. The transformer operating voltage is selected using a four position plug providing 110, 117, 220 and 240 volt operation. When I was ready to power the unit up I connected the Sansui's mains input to the output of my variac via a multimeter set to read AC current. This way I could slowly bring up the input voltage and check the unit for signs of excess current and heating of components etc. For this sort of exercise your nose is quite valuable as it will tell you when things are "smelling" hot. As I slowly increased the voltage the valve heaters began to glow slightly, and the input current rose quite rapidly as the HT circuit became loaded. I didn't try it for more than a few seconds but at about 200 V input the unit was taking more than 700 mA - definitely too much. An inspection of the 7591A and 6L6 data (obtained online) showed that the 7591A was designed for quite a high screen grid voltage, perhaps 450 volts whereas the 6L6 (and I don't mean the 6L6GC) really ought to have around 250 volts on the screen. The Sansui circuit diagram showed a nominal 420 V screen voltage confirming the 7591A data. This high screen voltage was causing excessive current to be taken by the 6L6 output tubes, even at the reduced supply voltage obtained from the variac. 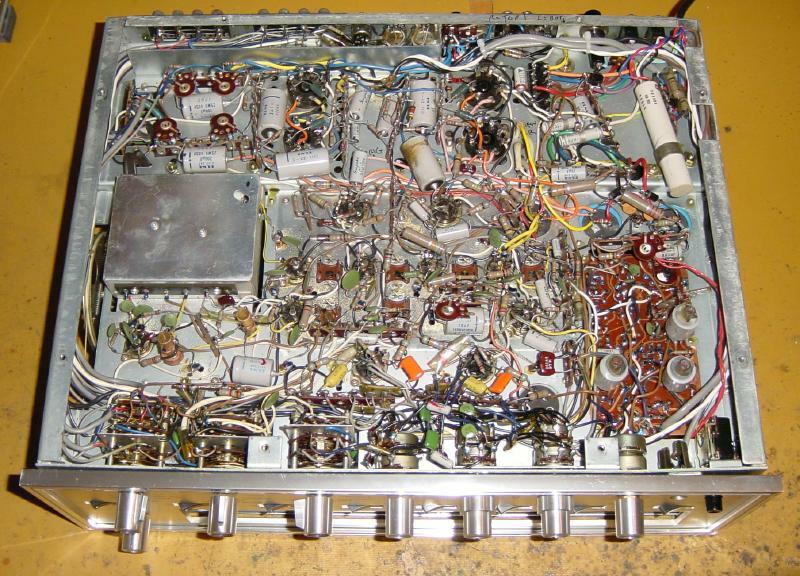 In the Sansui the HT voltage is generated by a 180 V RMS secondary winding followed by the classic "full wave" voltage doubler circuit. This uses the two alternate halves of the mains cycle to charge two capacitors wired in series providing (up to) twice the peak voltage of the input, in this case around 520V DC. Lower voltages used in this set are derived from a multi stage resistive divider, (often known as a dropper) with decoupling capacitors spread down the line to minimise the hum in the small signal stages. Using a simple modification I was able to connect the 6L6 screen supply to the mid point of the voltage doubler capacitors providing them 260V - just about ideal. I powered the unit up again and the input current was much more sensible, the exact figure escapes me. With a CD player connected to the AUX inputs and speakers hitched up I was in business! 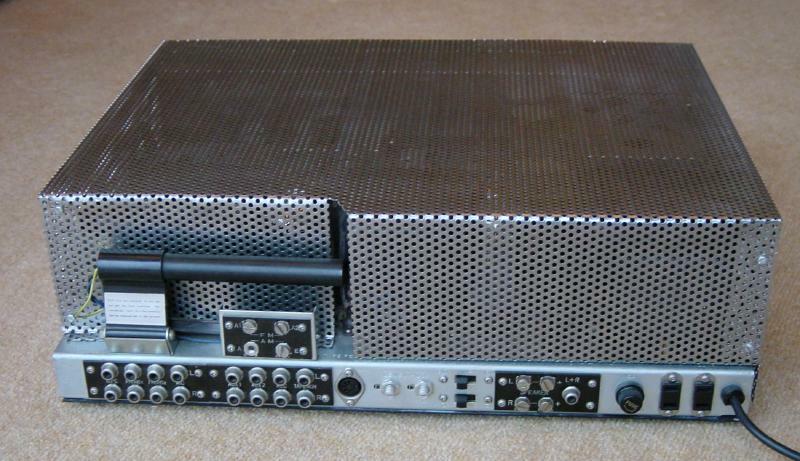 The unit has a front panel speaker switch which will connect an 8 Ohm resistive load to each of the output transformers and disconnect the ground connection to the speaker connector when switched to the "off" position. During the inital debug I used these internal loads rather than endure too many pops and bangs from real speakers as I probed round the rest of the circuit. The schematics show connections for 4,8 and 16 Ohm speakers but my unit supports only 4 or 8 Ohm speakers, selectable via a back panel switch rather than by changing connections. The repalcement transformer only has an 8 Ohm output and so I wired the impedance selection switch on this channel to select this in both positions. My speakers are a nominal 8 Ohms anyway. Another switch allows the phase of one channel to be reversed so if you wired up one of the speakers the opposite polarity from the other you can fix it easily. Because the circuit was not the same as the online schematics in this area it took a little while to work out what was going on :) If anyone is interested I could redraw this portion of the schematic and put it online or email it. The unit uses negative feedback from the 16 Ohm transformer taping back to the cathode of the 6AN8 driver pentode. Because the replacement transformer only has an 8 Ohm winding I had to use this for the feedback and so altered the value of the series feedback resistor on that channel accordingly (to try and keep the two channel's gain as similar as possible). I've no idea what the official standing current figure is for this set but I decided around 10 mA would be OK for the 6L6s, giving an anode dissipation (no signal) of approximately 5 watts per tube. I found that the four 6L6s were pretty evenly matched, at least for the standing current, and ended up with three grids set to -26 volts and one at -24. A little mains hum was evident at the output with this configuration and I replaced the (non original and leaking) 50 uF HT smoothing capacitors with some good 330 uF units I had to hand; the circuit diagrams show 200 uF capacitors and so the 50 uF units were much too small. This change fixed the hum problem. With the now much larger smoothing capacitors I decided to replace the two original rectifier diodes with new 3A 1kV devices as a precaution. Blown semiconductor rectifiers in power supplies can cause the total destruction of the transformer very quickly because they often fail short. After some further checks the unit was "deployed" into the living room and used as a part of our otherwise aged but currently all solid state hifi setup. As this point there was still no lid for the unit and to keep hands away from the high voltage points at the back of the unit I put it in a wooden cabinet we have whose dimensions made it hard to get one's hand in. A short period of use ended when I noticed a moderately loud hum in on channel and also some distortion as well. A lengthy period of debugging back in the office ensued. Eventually I found that the hum was caused by one of the 6AN8 triode/pentode driver valves which presumably had developed and intermittent cathode/heater path. Someone more experienced with valve audio equipment would have found this much quicker I think although I learned something in the process and so it was time well spent. As a precaution I replaced 2 coupling capacitors in each channel and the distortion disappeared. A check of the DC voltages indicated the two channels were back in step again. At this point more listening tests indicated the unit was working well enough to use as a part of our regular hifi system. The 7591A has a a greater power rating, a slightly lower heater power and lower distortion than the 6L6 and so I decided to fit these to the unit. I bought four 7591As from Watford Valves. I rewired the octal bases to suit the 7591As, double checked and then powered up, no variac this time :) I had already arranged the tube's bias to be set for minimum current as a precaution and after warming the unit up set the tubes for about 15 mA each, no signal. I've readjusted the bias after some hours of use because the currents had changed slightly from the 15 mA I'd originally set. With unit connected up in the living room again I can honestly say it sounds absolutely great. I've not investigated the radio section seriously but it appears to work fine with plenty of sensitivity on both the AM and FM bands and successful FM stereo de-multiplex. The stereo indicator is a neon, rather than an incandescent bulb or LED. I made a top cover for it so it was safe for all to use. This cover was not as easy to make as I'd hoped because replacement transformer is taller that the original type and so the top surface of the new cover has proud of the top of the front panel. I made a folded back section to allow the top cover to sit squarely on the top portion of the dial cover which sits behind (and lower) than the front panel. In the end I think it looks ok and allows the glow from the tubes inside to be seen as well because I used perforated sheet. I hoped the perforations would help with the cooling although the region over the right channel o/p tubes (located on the l/h side of the chassis) and dropper resistors still gets pretty warm. One of my well informed audio friends has suggested I could, or even should, use a higher standing current in the interests of fidelity but to my ears it sounds nice as it is. Because it would run hotter with more current I've left it at 15 mA per tube for now. If someone with better ears than me heard it they'd probably suggest the same increase I guess, we'll see. In summary I'm most pleased I was able to get this receiver working properly. It's certainly not a perfect specimen but is works well enough to be part of the household and not just a curio. It's actually a pretty feature rich piece of equipment and has integrated into my sound system with ease. A little online research suggested that my model was likely to have been made around 1968 and so it's 35 years old this year! Recently I found the "The Best of SANSUI" website located here. There are some pictures of the 1000 range, including the 1000A model and you will also find some pictures of the 1000A here. One of the most useful items in my "shack" is my 1 amp variac. 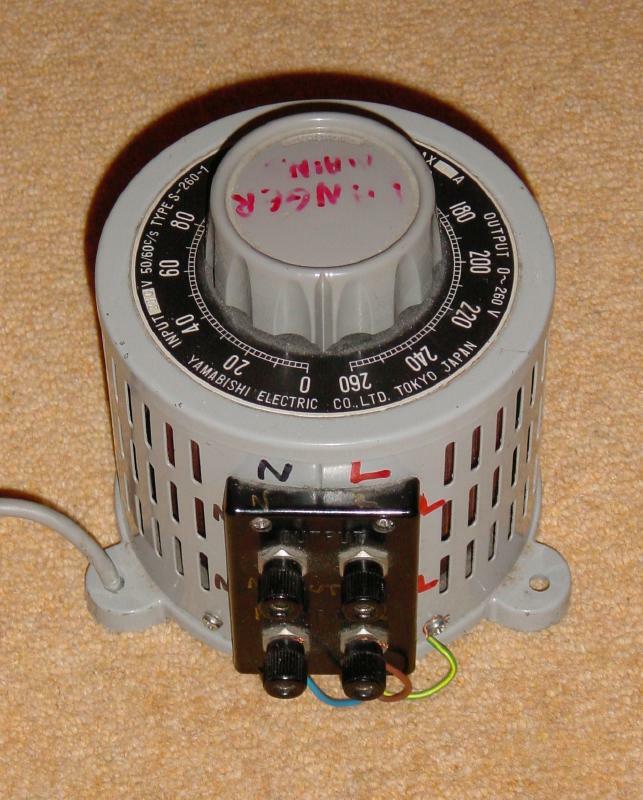 For those that don't know a variac is an adjustable transformer allowing one to vary the AC voltage on it's output. I think the word Variac is a trade name. Most variacs with be adjustable from 0% to about 110% of the input voltage. In the UK, for example, my variac will provide between 0 and around 260 V RMS. Being auto transformers variacs do not provide isolation from the mains supply and so should be used in conjunction with an isolation transformer if an isolated adjustable supply is required.